The beetle can be easily underestimated but if moved on top of your opponents queen bee, it can be a devastating piece as you can then place directly around it. Keep hoppers in reserve for end moves, to get into positions that are surrounded. Bring out spiders early on in the game as they are very good as short runners when the hive is still small. Keep an eye on your opponents holding set, even if it looks like you're in a losing position, you can turn the game around by blocking spaces if they have no hoppers or beetles to place. Look for opportunities to move your bee out of a possible surround Situation, as a one space move by your bee can be devastating to your opponents plans. Always take advantage of the two for one deals, where your opponent places two of their pieces in a line, you then block both of their pieces with one of yours. This gives you control of the outside edge of the hive and forces your opponent to place again. Favorite opening combination, spider, ant, bee, in a V formation, If the opponent brings out one of their ants, you can block it with yours, this gives you the advantage of having an ant free while your opponent will have to place another piece. Try and keep your pieces on the outside edge of the hive and you opponents inside, as this will restrict their movement and give you freedom of movement. Ants are very good at keeping control of the outside edge of the hive. Another favorite opening combination; beer spider, spider, also in a V formation, then blocking early with one of the spiders or even both if your opponent brings out their bee on their forth place. 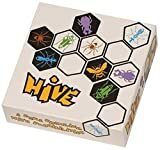 Hive can be played at a very fast pace, increasing the pace of the game by placing and moving your pieces straight after your opponents turn and using the time they take to play to think can give you a mental advantage. There is no advantage in going first, however if you can be the first to block your opponents queen bee and still keep yours mobile, will put you at a big advantage and you can dominate the game by forcing your opponent to play defensively.